A White Dragon that resides in Goldoa. Ena’s grandfather. 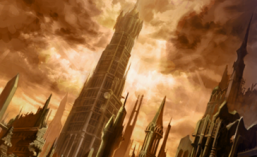 Before the Mad King’s War, he fled Goldoa after a disagreement with Dheginsea regarding his policy of Laguz and Beorc coexistence. After the war, Nasir elects to return to his homeland of Goldoa, whereupon Dheginsea opens up to him and informs him of all the hardships and troubles he had been hiding all this time. Nasir regrets his actions upon hearing this, and pledges absolute loyalty to Dheginsea. He often dotes over his granddaughter Ena, loving her above all else. However, the two found themselves on opposite sides of the conflict when she opposed him and Dheginsea alongside Kurthnaga. Despite that, in the end, he honored his pledge and remained with the king, standing in the way of the combined army of Laguz and Beorc. 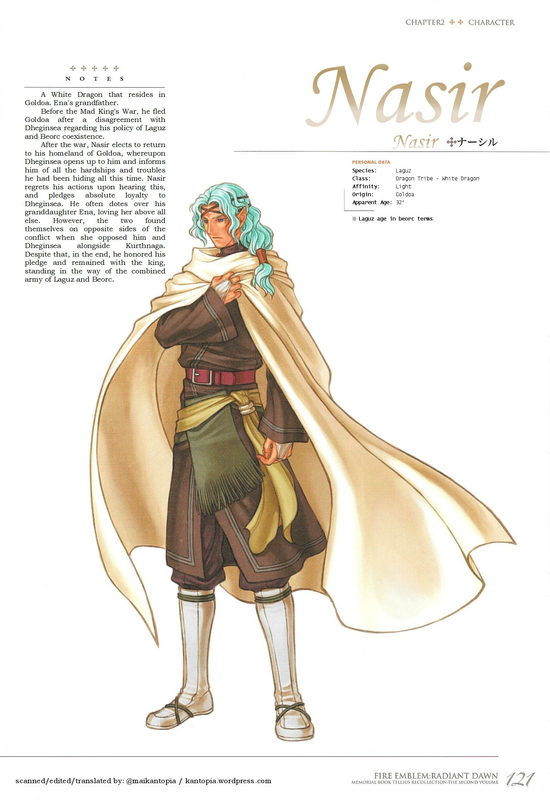 This entry was posted in Artbook, Fire Emblem, Translation, Video Games and tagged background, character, character design, concept art, Gamecube, guidebook, intelligent systems, japanese, memorial book, nasir, nintendo, path of radiance, radiant dawn, tellius recollection, Trivia. Bookmark the permalink.